How Many Drones Does It Take To Screw In A Lightbulb? Imagine. There you are, comfortable in your lounge pants. Lounging in your lounge. Suddenly in the distance you hear a buzzing. Quiet at first, then louder. A light bulb goes on in your head. You forgotten that you’d scheduled an Amazon drone repair service in partnership with The Home Depot and Dewalt. They break through the window, spraying you with shards. They paint the spots on the walls. Snap photos of the brands in your closet. Change the light bulbs. Place a bandaid on your glass wounds. Pick up the shards and leave. Repairing it on their way out. Of course the first step before this dark future comes to be is to see if it can be done; which is what [Marek Baczynski] and a friend accomplished many broken light bulbs later. Using an off the shelf drone with three springy prongs glued to the top they try time and time again to both unscrew and screw in a light bulb. They try at first with a lighter drone, but eventually switch to a more robust model. After a while they finally manage it, so it’s possible. Next step, automate. Video after the break. Back in 2012, the LIFX light bulb launched on Kickstarter, and was quite successful. This wireless LED lightbulb uses a combination of WiFi and 6LoWPAN to create a network of lightbulbs within your house. Context Information Security took a look into these devices, and found some security issues. The LIFX system has a master bulb. This is the only bulb which connects to WiFi, and it sends all commands out to the remaining bulbs over 6LoWPAN. To keep the network up, any bulb can become a master if required. This means the WiFi credentials need to be shared between all the bulbs. Looking into the protocol, an encrypted binary blob containing WiFi credentials was found. This binary could easily be recovered using an AVR Raven evaluation kit, but was not readable since it was encrypted. After cracking a bulb apart, they found JTAG headers on the main board. A BusBlaster and OpenOCD were used to communicate with the chip. This allowed the firmware to be dumped. Using IDA Pro, they determined that AES was being used to encrypt the WiFi credentials. With a bit more work, the key and initialization vector was extracted. With this information, WiFi credentials sent over the air could be decrypted. The good news is that LIFX fixed this issue. Now they generate an encryption key based on WiFi credentials, preventing a globally unique key from being used. [ElectronUpdate] has posted many great reviews of commercial LED bulbs that one can purchase to replace standard E26 incandescent light bulbs. In his reviews he evaluates the light emitting performance and does a thorough and detailed teardown, evaluating and understanding the circuit technologies used. For the light emission evaluation he uses a light meter and some homemade graph paper to plot the lumens at different angles. Flicker is easily evaluated using a solar panel from a discarded solar path light connected to his oscilloscope. Any flicker will show up quite nicely and can be measured. Of course a kill-a-watt meter makes an appearance in most reviews to read watts and power factor. Recently [ElectronUpdate] wanted to understand the meaning of CRI which is advertised on many of these commercial LED packages. CRI stands for color rendering index and deals with how colors appear when compared to a natural light source. After doing some researching he found that a CRI over 80 is probably good for LED lighting. The next dilemma was how to measure CRI without expensive scientific equipment. 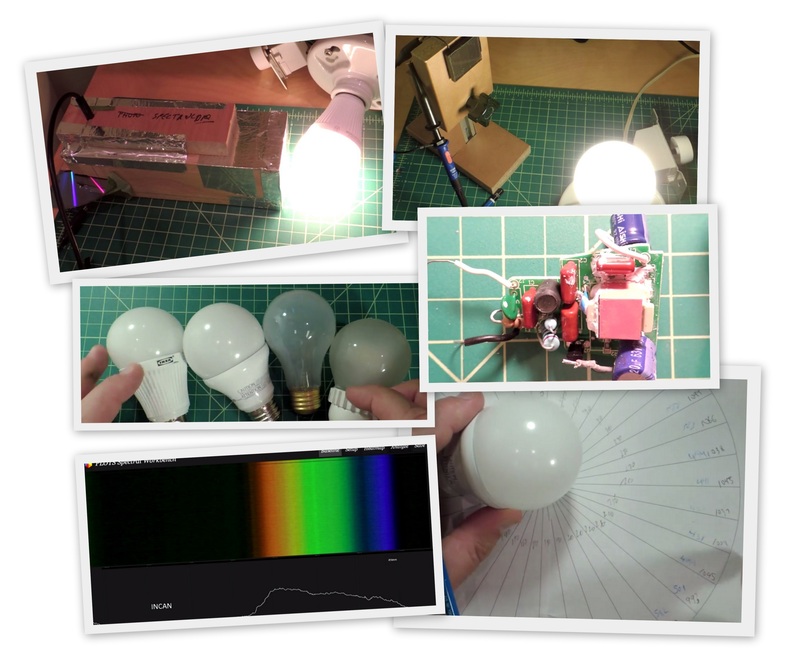 He found a website that we have featured before with free software and instructions on how to build a spectrometer. The web instructions include building a meter box from paper but he found it was much more reliable if built out of wood. We’ll let you follow [ElectronUpdate’s] recommended build if you like, but you’ll need a few items which he does detail. After a short calibration procedure the final rig will measure power spectral line densities of your light source. [ElectronUpdate] is promising more details on how the colorful measurement data can be related to CRI ratings, but you can get a jump on the details at Full Spectrum Solutions. We also recommend you browse through all of [ElectronUpdate’s] LED bulb reviews on YouTube if the progressing performance and innards of LED bulbs fascinates you as much as it does us. Want to make the above yourself? [Sprite_tm] did a thorough job documenting the build step by step (complete with pics, schematics, graphs, and links to the parts used). In summary, [Sprite_tm] busted open an Ikea CFL bulb to reuse the housing. Inside, he installed a scavenged power supply, ATtiny44, RGB LED module, and a radio receiver. A remote control allows [Sprite_tm] to change the lighting of his room to nearly any color. The cost of the project is a little under $30. The price tag isn’t so steep when one considers the insanely long lifetime of LEDs.